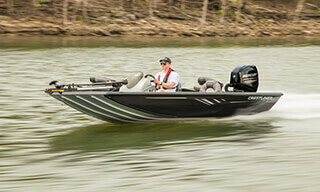 The Bass Hawk is a new generation of bass boat. 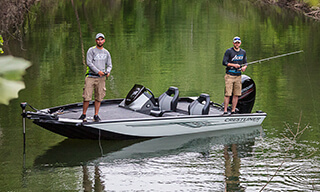 This deep-v bass boat features the Fish Hawk’s ultra-stable hull design and raised bow and stern decks similar to the ones you’d find on the PT. 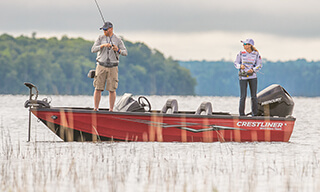 Combined, the Crestliner Bass Hawk provides exceptional maneuverability so that bass and multispecies anglers can fish more confidently in larger waters with rougher conditions. With powerful performance and unmatched stability, the Bass Hawk is the perfect platform for bass or muskie angling supremacy. It’s easy to recognize the attention to detail in this boat from the moment you step onboard. 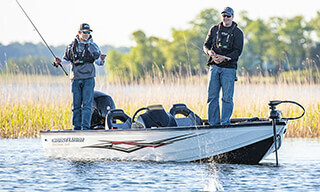 Inside the boat you’ll find a 28-gallon stern livewell and lockable center bow rod storage that holds up to 15 rods. 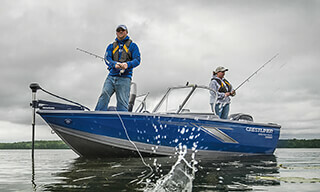 The boat itself is completely wood-free for added durability, and the variable degree deadrise hull provides a steadier, more comfortable experience in any condition.